“UKELELE KANIKAPILA“, a gathering of ukulele players and those who are interested in learning to play, and in listening to uke songs. 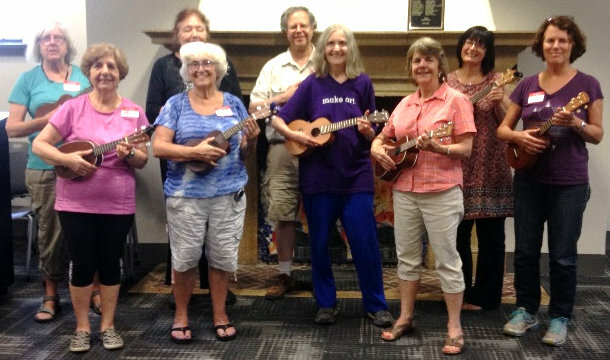 An invitation to the Arlington community to join “Uke in the Afternoon” (in the evening! )…and other members of the Ukulele Union of Boston. It is being held as a Thank You to the Robbins Library for having hosted our group for nearly three years! The program will begin with a selection of songs played by group members who have been attending regularly. Then audience members (even those with no experience) will be invited to join in playing several two chord songs. And an open Mic session for all uke players will round out the program. Remember to bring a ukulele and a music stand if you have one. Some loaner ukes will be available. But come and join us even if you don’t play a ukulele, everyone is welcome! This event will be held in the Community Room, Robbins Library, 700 Mass. Ave., Arlington and is free and open to the public.